At some time, most homeowners hire someone for repairs or renovations. Even a homeowner experienced in home repairs may have to hire a contractor or renovator because of the size or difficulty of the job. This fact sheet will help you choose a contractor, helping you to work effectively and fairly with the contractor to achieve the results you desire. Once you have decided to renovate and basically know what you want, choosing a contractor or renovator is a crucial decision. It’s not something you should rush into. The contractor you hire should have the tools, the experience, and the technical, business and interpersonal skills, to get your job done. Hire a contractor who has experience with projects similar to yours. They will know what materials and techniques are needed for your project and–even better–about any potential problems and how to solve them. For large projects, you can hire a contractor to take charge of the whole job, since many renovation contracting companies are set up to handle both design and renovation work. You may hire an architect, architectural technologist, depending on the size of the project, or a designer to prepare your project’s plans for a permit application. Then invite contractors or renovators to submit a quotation based on these plans. These professionals may also oversee your project, which can mean anything from, obtaining all necessary permits, to hiring a contractor and supervising the work. Start by researching several contractors by asking family, friends or neighbors who have recently renovated their homes. They can tell you about the dependability of the contractors they worked with, the quality of the work and their overall experience with that company. Other great sources include, local home builder and renovator associations, local building supply stores, and, in some municipalities, the local building department. You can also check out contractors’ websites. Meet with a few potential contractors to get their advice and suggestions on how they would do the work. At the first meeting, some may give you a rough estimate of costs, depending on the project’s scope and complexity. But usually, the first meeting is more to get to know the contractor and the contractor’s work. Unless you have been able to check out the contractor ahead of time, you should not sign anything or pay anything at this stage. Just make sure you ask a lot of questions. Have you done a similar project before? Will you use your own crew for the work, or will you sub-contract any parts of the job? How would you handle a specific problem related to this project? Ex: installing kitchen cabinets on your sloping floor? What kind of warranty do you offer? What does it cover? You won’t offend reputable firms by asking questions. If a contractor doesn’t seem to know much about the technical details of the job, or doesn’t want to talk about them, it’s probably the wrong contractor. If the contractor plans to do the whole job alone, make sure he or she has all the necessary skills and qualifications. Most importantly, be sure you get along with the contractor. If you cannot communicate effectively with the contractor, things can get very tense in a lengthy project. The best contractors will explain what’s going on as the project takes shape, discuss problems reasonably and work with you to make the result as good as it can be. You also want someone who’s willing and able to help you refine your plans, if necessary, so your project ends up more cost-effective and better looking. A knowledgeable contractor will be able to suggest ways to get what you want and meet your budget. The best proof of quality is satisfied customers. Try to get at least three references for each contractor you meet. But don’t accept the references at face value. Phone them, and ask about their experience with the contractor and their tradespeople. How satisfied were they with the quality of the work? Were there any problems? Did the contractor keep them informed throughout the project? Did the contractor’s crew keep a clean work site? Was the work done on schedule? Were there changes to the scope of the work, and if so, how were they handled? Would they hire the contractor again or recommend the company to friends or family? If the previous clients are willing, visit them to see the finished job. Their willingness itself is usually a sign that they were satisfied. You can also check with your local Better Business Bureau. It records complaints about contractors in your community. How many estimates do you need? There are no hard and fast rules. Some consumers prefer to get a number of bids before making a decision. Others find that after the interview process, there is one contractor they strongly prefer, and only ask that contractor to submit a formal written estimate or proposal. What really matters is that you end up feeling that you have adequate information to make the right choice. As a general rule, with the proper drawings and specifications, three estimates will usually provide sufficient information to make a decision. To get estimates, especially for substantial projects, you’ll need good-quality drawings and detailed specifications–even with a small project. Be as specific as you can: the type of flooring, doors, windows and finishes you want. For a large project, it can take two to three weeks for a contractor to prepare an estimate. You might even want to ask the contractor to submit it in person so you can discuss it with them. Compare the estimates carefully, making sure that it covers everything you asked for, and what the contractor will have to do to complete the job. Assume that anything not listed is not included in the price. Make sure the contractor also provides a construction schedule. In some cases, a contractor will give you a “fixed price” quote. A fixed price includes all the materials, labor, equipment, fees, plus contingencies, overhead and profit. Sometimes, allowances are made for items that you have yet to select, such as flooring and light fixtures. The allowance, which is only an estimate, is later adjusted once you have made your final selection. If it is difficult to estimate just how much the job will cost—for example—an old house that might need extra work, you can use the “cost-plus method”. In a cost-plus contract, you pay the contractor the actual cost for labor, materials, equipment and a percentage for overhead and profit. Because cost-plus contracts leave costs open-ended, it is best to set a limit, so costs don’t get out of hand. Remember that renovations sometimes uncover hidden problems, so it is important to include a contingency budget to cover unforeseen costs. Another option is a design-build contract, in which a renovator designs and carries out the whole project. You can use either a fixed price or cost-plus contract, again with a set cost limit. Don’t automatically choose the contractor who gives the lowest estimate. It may be unrealistically low. The contractor may not have fully understood the project, may be underestimating what it will take to complete the work, or might simply be trying to get a price advantage over the competitors. In any case, you could risk unexpected and mounting costs, or you may end up with a job that leaves you unsatisfied. Look for a fair price. Factor in any differences between the contractor's offers and the skills they bring to the job. Then add the intangibles: reputation, willingness to make suggestions, offering advice and the likelihood that they will stand behind their work. Choose the contractor you feel will give you the best overall value for your money. Do not be tempted by a contractor who doesn’t have an address, doesn’t want a written contract and offers a discount if you pay cash. This type of underground economy transaction is really risky. There are innumerable pitfalls that can offset any savings. For example, contractors who insist on cash may be unlicensed and uninsured. Without a written contract your cash advances are unprotected. They could neglect to get the required permits or inspections. Product warranties may not be valid if a recognized contractor does not install the items. An underground contractor may also do poor work and create health and safety problems. If one of the contractor’s crew is improperly trained, is injured on the job or damages your property or a neighbor’s property, your homeowner’s insurance policy might not cover you, and you could be held liable. A cash deal may leave you with no legal recourse if something goes wrong, the work isn’t satisfactory or if the contractor walks off the job without finishing it. In fact, it makes it difficult for you to prove the contractor was ever there. After you have paid the contractor, you may find that materials haven’t been paid for, or workers haven’t been paid and you are responsible for the bills. For your own protection and peace of mind, it’s best to deal in a legal and responsible way; always get it in writing. A detailed written contract between you, and the contractor you hire is essential to any renovation or home repair project, no matter its size. Even the smallest job should be put in writing. When the job is finished, the contractor may ask you to sign a certificate of completion. Don’t sign it until you have thoroughly inspected the work. If the contractor will have to return later to finish a few minor details, make a note of it, and if appropriate, hold back a portion of the payment to cover the outstanding work. Professional contractors offer a warranty on their work and will come back if something goes wrong. This type of holdback provides homeowners with protection, should subcontractors or suppliers place liens against the property; if they haven’t been paid by the general contractor for their services. This allows a period of time, after the project is completed, for them to make any required claims. At times, the general contractor will arrange for these funds to be held in trust by a lawyer. If there are no subcontractors or suppliers involved, this requirement will not apply. Note: The Builders Lien Holdback funds cannot be used to correct deficiencies. Each province has its own regulations regarding this type of hold back, so verify them with your provincial authority. When a project is substantially completed, there are often a number of items that are incomplete and/or that may need to be corrected. It is a standard to hold back a reasonable amount of money cost per item or a percentage of the total cost of the project. Once these items have been satisfactorily completed, the rest of the payment should be forwarded to your contractor. Depending on the time of the year that your project is carried out, there may be items that cannot be completed, (exterior painting, landscaping, etc.) and there may be products/material that are not readily available. In these situations, you should hold back payments equaling the cost of the items that will be completed, once the season changes. Once the job is underway, you’ll see a lot of your contractor and their crew. The job will go much better if there is mutual respect and you co-operate with them. Make sure to communicate with your contractor, so you know what’s going on and what might be needed from you, such as an empty driveway for deliveries. Don’t call every five minutes. Make a list of your questions and save them for a time which you are both available. Sometimes things the contractor can’t control, like bad weather and back-ordered components, can delay the job—so leave a little leeway in your schedule for unexpected setbacks. 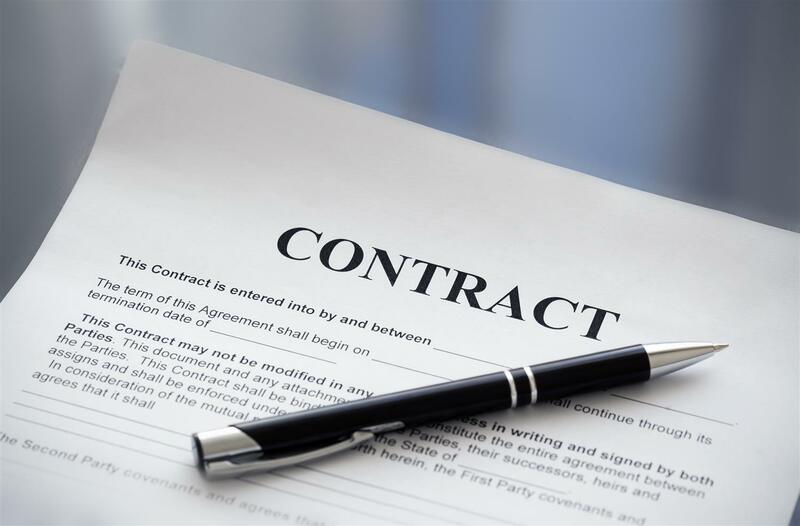 In spite of a clear, detailed contract, disputes can, and occasionally do, arise for any number of reasons. Good communication can go a long way in settling any disagreements. As a first step, you should sit down together to discuss the problem calmly, and seek a solution that you can both comfortably live with. This is usually the fastest, least expensive, and ultimately, the most satisfactory approach. Try to be reasonable. Don’t overreact if something goes wrong, and allow sufficient time for your contractor to respond. If these steps have not helped, you can follow the dispute resolution method. This means using a mediator and you can identify one in the contract. Architects and construction arbitrators are often used to settle disputes. As a last resort, in cases where things are going so badly that the project seems unworkable, you can cancel the contract, which is why it’s wise to put a termination clause in your contract. You’ll likely have to pay to get out of the deal, so it’s best to agree on the cancellation penalty before you start. If you think that some of the work is not up to local building standards, report it in writing to the appropriate inspection department, along with a copy to your contractor. If the work doesn’t meet building code requirements, the contractor should have to correct it at his or her expense. You can also report poor workmanship and unsatisfactory business practices to the government department that granted the contractor a business license. There are several laws that protect consumers. Provincial and territorial consumer affairs or consumer relations departments, usually administer these laws. They can help you resolve any problems between you and your contractor. Sometimes a phone call is enough, but a letter outlining the problem giving names, dates, addresses, and details is often required before any action can be taken. The consumer protection authority may send a building inspector to examine the work. The inspector’s report may be enough to settle the dispute. If not, the consumer protection office may provide mediation. The power of a government consumer protection office is a strong incentive to settle. If it isn’t and legal action is required, the consumer protection office will give you further advice and assistance. The Better Business Bureau, a monitoring agency maintained by the business community, will also handle consumer complaints, mediate disputes and try to get a fair settlement. If legal action is necessary, you may be able to take the contractor to small claims court without having to hire a lawyer. You’ll also avoid the complications and delays of a formal court case. Although small claims court is relatively informal, its decisions are binding. The size of the claim you can make depends on the province or territory where you live. Your local courthouse can give you this information and direct you to the office that handles small claims cases. It’s important to make sure the contractor has workers’ compensation and third-party liability insurance for each person on their crew, and for any damage, they may cause—$2 million is standard—although this may not be the case in rural areas. Your local homebuilders’ association is a good source of information for what is standard in your area. Don’t just take the contractor’s word; ask to see a certificate and check to make sure it’s current. Don’t accept or assume any liability for the contractor or trades people. As for your own liability, your homeowner’s insurance policy may cover you during a renovation by a contractor, but you should always advise your insurance provider of any renovation work ahead of time. Remember, if you’re acting as your own general contractor and employing trades people, your policy won’t automatically cover you. You’ll have to ask your insurance company for temporary coverage, which will likely involve a small extra premium. Again, make sure any tradespeople you hire have their own insurance.